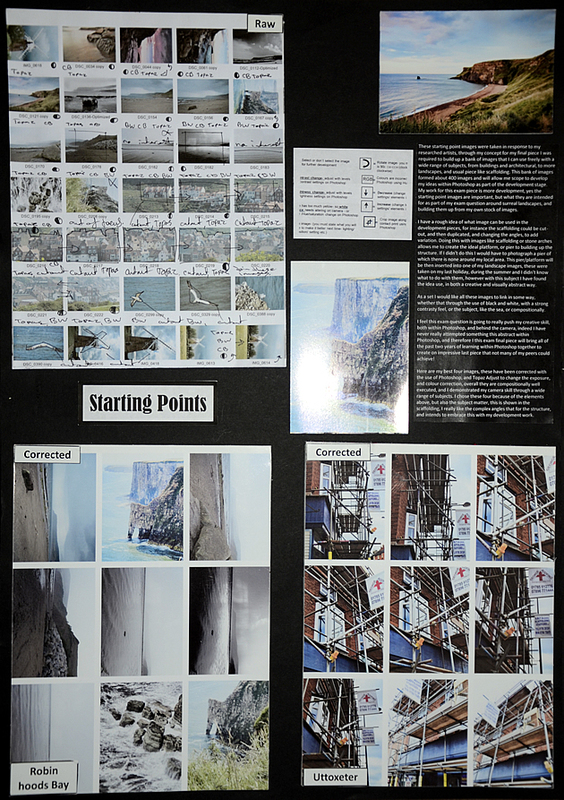 This examination project was completed by Michael Deville while studying A Level Photography (AQA) at Thomas Alleynes High School, Uttoxeter, Staffordshire, UK. The project explores a growing population and a futuristic new world. 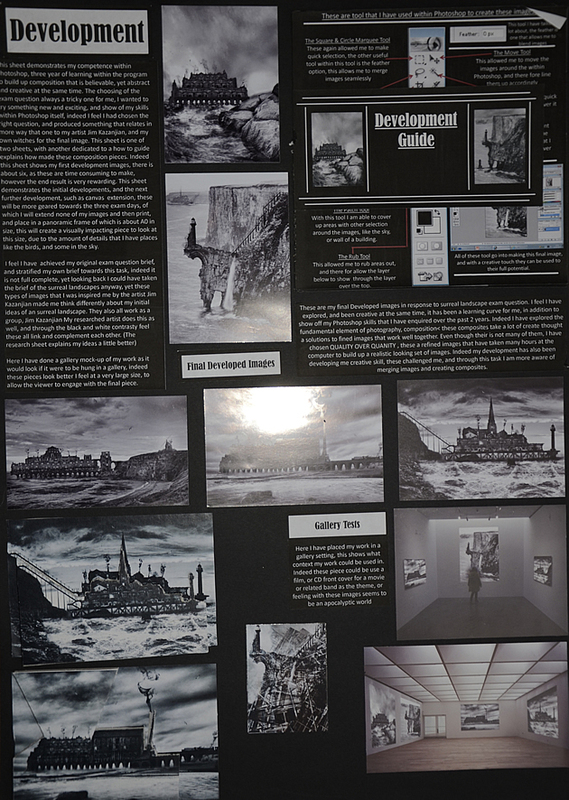 Michael gained an A* grade and has had his work featured in Black and White Photography magazine (UK). Michael’s Photography submission is an excellent example of how to approach a project in a riveting and original way: combining local imagery to create breath-taking fantasy scenes. While some Photography students complain about their set exam topics, others, like Michael, grab a starting point by the horns and turn it into something wondrous. 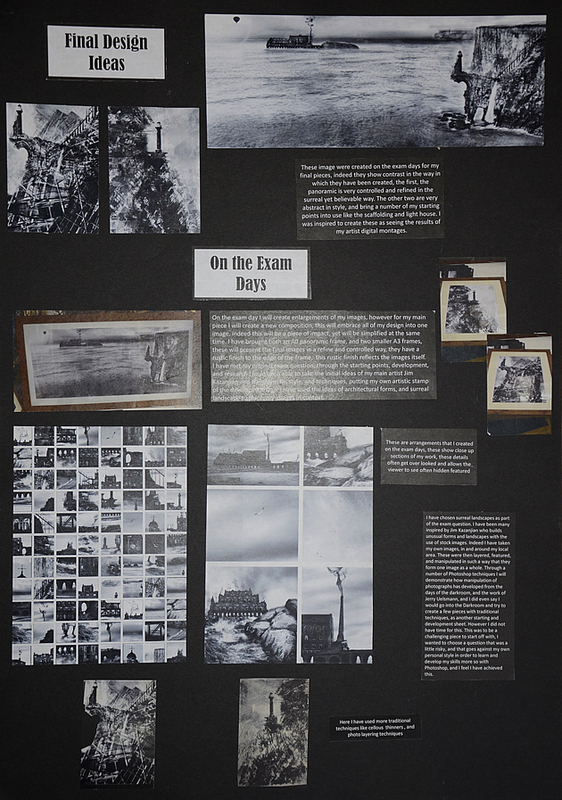 Please give us an overview of the themes and ideas behind your A Level Photography examination. Michael: I chose ‘surreal landscapes’ as part of the exam question. 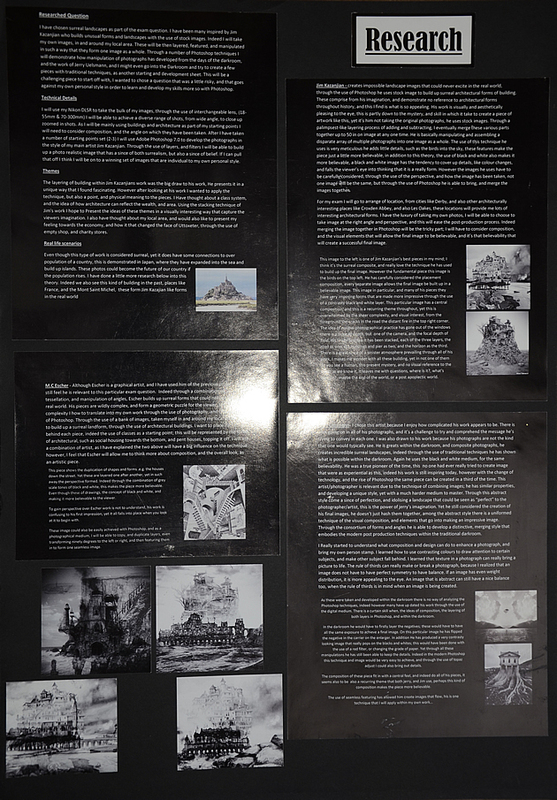 I was inspired by Jim Kazanjian, who builds unusual forms and landscapes with the use of stock images. I took my own images, in and around my local town of Uttoxeter. 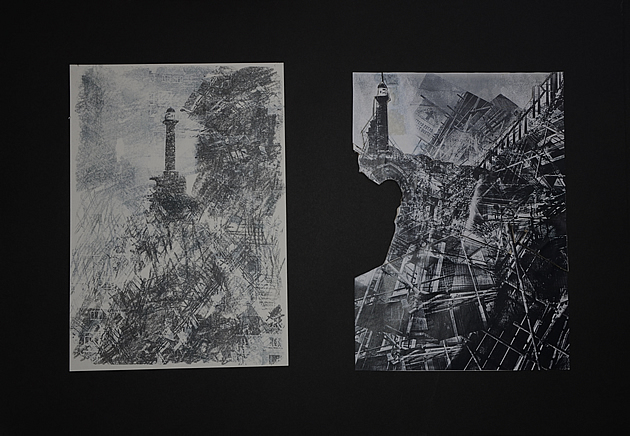 These were layered, featured, and manipulated in such a way that they form one image as a whole. The layering of buildings within Kazanjian’s compositions was the big draw to his work; he presents it in a unique way that I found fascinating. However, after looking at his work, I wanted to apply the technique, but also my own meaning to the pieces. I thought about a class system, and the idea of how architecture can reflect the wealth and area. 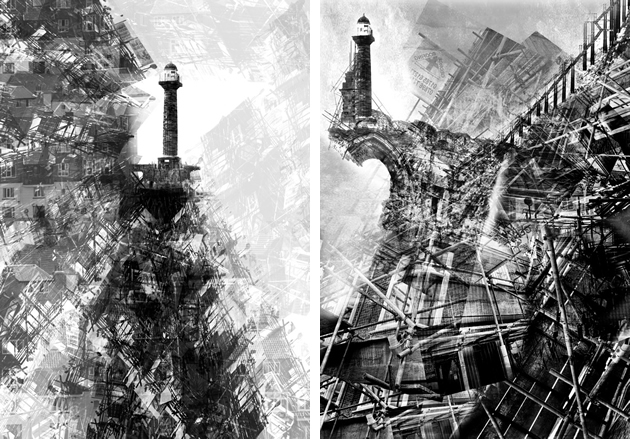 Using the stacking technique of Kazanjian’s work, I presented the idea of these themes in a visually interesting way that captured the viewer’s imagination. I also thought about my local area, and wanted to present my feeling towards the economy, and how this changed the face of Uttoxeter, through the use of empty shops and charity stores. Even though this type of work is considered surreal, it does have some connections to the over-population of a country. This is demonstrated in Japan, where they have expanded into the sea and built up islands. These photos could become the future of our country if the population rises. I have done more research into this theory. Indeed, we also see this kind of building in the past, in places like France and Mont Saint-Michel, which have Kazajian-like forms in the real world. Your project includes highly successful, emotive composite photographs of a futurist new world. Which digital manipulation tools and techniques did you use to create these works and how have you managed to create such convincing compositions? Michael: I used a Nikon DLSR (see this camera at Amazon US and Amazon UK – affiliate link) to take the bulk of my images. Through the use of an interchangeable lens (18-55mm & 70-300mm), I achieved a diverse range of shots, from wide angle, to close up and zoomed in. After I had taken a number of starting points, I used Adobe Photoshop 7.0 to develop the photographs in the style of my main artist. Through the use of layers and filters, I built up photo-realistic images that have both a sense of both surrealism and believability. George Robinson-White, one of two Photography teachers at Thomas Alleynes High School, is very knowledgeable and accomplished with the use of Photoshop, however, I was mostly self-taught the previous year, while doing my GCSEs at the school. YouTube was a big help! When I moved into the Sixth Form to do A Level Photography, I was already accomplished with every aspect of Photoshop. This project was intended to be a final demonstration of my skills and competence within the software. Many of my peers on the course had very little skill with Photoshop and could not achieve the illusion that I created and developed for my final exam pieces. Once one composite piece was completed, I felt compelled to create more: six in total. Each one was a slow process, averaging about 5-7 hours each. Patience and an eye for detail made my work successful, taking the time to cut and paste every part of the image to build up something that was visually interesting to the viewer. Black and white was important to achieve the desired effect. I found with colour there was too much going on and it didn’t seem as convincing. However, I experimented and de-saturated the images, making them more believable, bringing every individual image together as one. The black and white adds a certain atmosphere to every image – there is a sense of mystery and wonder in the images. Many structures within my images were built from scratch. I do not live near the sea, so I had to come up with new and creative solutions. I took pictures of scaffolding and lampposts to build up piers and other structures. I went to old ruins, such as Croxden Abbey, which provided me with crumbling stone and the arches. Many of the seascape images were taken while on holiday in the summer, in and around Whitby, North Yorkshire. 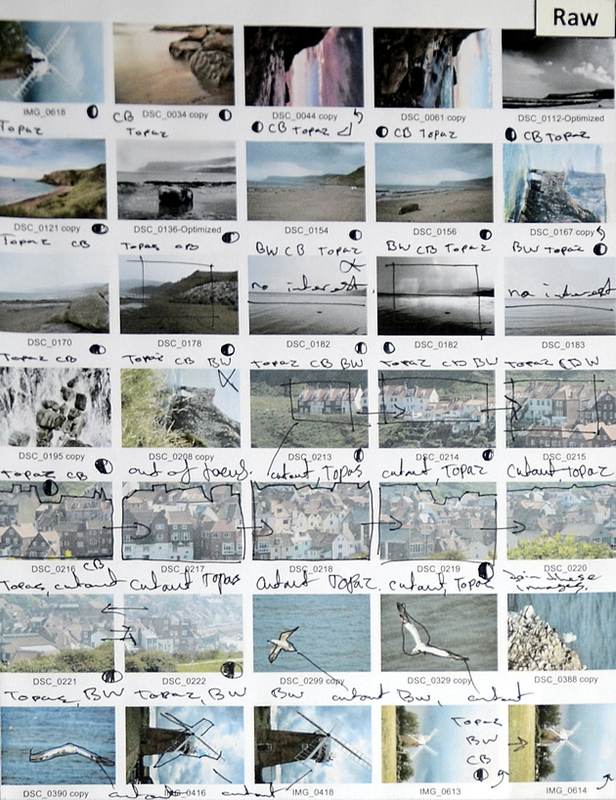 I didn’t know what to do with this bank of images, however when I thought of this project, these were the perfect resources for a starting point. Which photographers (or artists) did you study as part of your project and how have these influenced your work? Michael: As noted above, Jim Kazanjian creates impossible landscape images that could never exist in the real world. Through the use of Photoshop, he uses stock images to build up surreal architectural forms. These are comprised from his imagination and demonstrate no reference to architectural forms throughout history – and this I find is what is so appealing. I also chose Jerry Uelsmann because I enjoy how complicated his work appears to be. I was drawn to his work because his photographs are not the kind that one would typically see. He is great within the darkroom and with composite photographs. He creates incredible surreal landscapes. Through the use of traditional techniques, he has shown what is possible within the darkroom. Although M.C Escher is a graphical artist (and I had used him in the previous project) I still felt he was relevant to this particular exam question. Through a combination of tessellation and manipulation of angles, Escher builds up surreal forms that could never exist in the real world. His pieces are wildly complex, and form a geometric puzzle for the viewer. This complexity was translated into my own work, through the use of photography and Photoshop. What advice do you have for other high school Photography students who wish to gain excellent grades? Be spontaneous, think of new creative approaches. Step aside from clichÃ© and mediocre subjects. I got bored of seeing the same approaches while doing A Level Photography, and wanted to try something challenging that had not been achieved before. Striving to learn and succeed within a subject that I am so very passionate about allowed me to achieve my final grade. This is one of the many outstanding Photography projects celebrated by the Student Art Guide. We hope that this project provides a useful distant learning opportunity and a motivational example for those studying high school qualifications such as A Level Photography, IGCSE / GCSE, NCEA, IB and AP Studio Art.